Laravel is an open source PHP Framework for developing web applications using an architectural template based on Symfony Model-View-Controller (MVC). It is highly popular among developers due to its rapid development capabilities. In Laravel, the framework code is separated from the developer’s one and each component is easily extensible. It supports working with various databases, sending notifications in various ways: mail, Slack, etc. and websockets technology for creating real interactive applications. Let’s get through the installation process. 1. Enter the Jelastic dashboard, find Laravel framework in the Marketplace and press Install. Alternatively, you can import the Laravel PHP framework manifest. 2. In the opened dialog, specify the Name of Environment and choose the preferred Region. Click on Install. 3. Wait a few minutes till installation is completed. Open the welcome page of a default Laravel project from the successful installation message by pressing Open in Browser. Welcome page contains the first essential links for getting started with the framework. The new project is the independent clone of the default one that was created while the framework installation. Let’s create a Laravel new project with database CRUD operations example. 1. Add a database node to the environment. To do this press Change Environment Topology and add a database node, for example, MySQL. 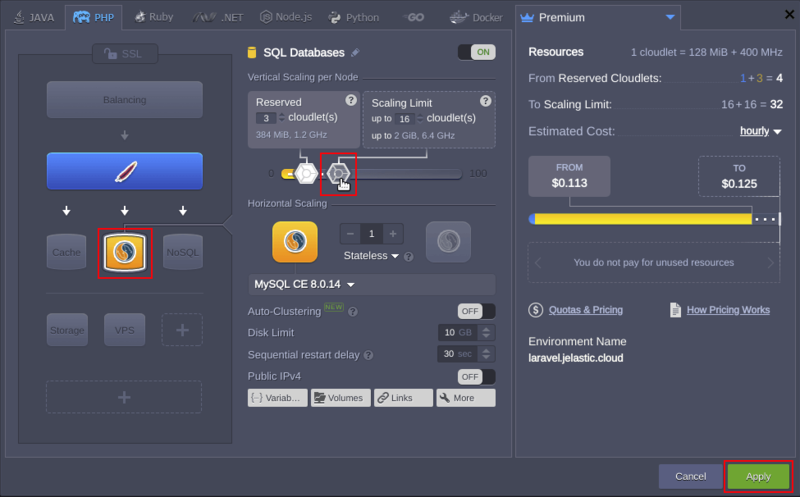 Add necessary resources in Vertical Scaling per Node section and press Apply. 2. Once the database node is added to the environment the topology is changed. The database access credentials can be found in the respective email. The script comes with brief comments in it and can be found in the framework root directory ~/webroot/ROOT after package installation or downloaded from GitHub by link. 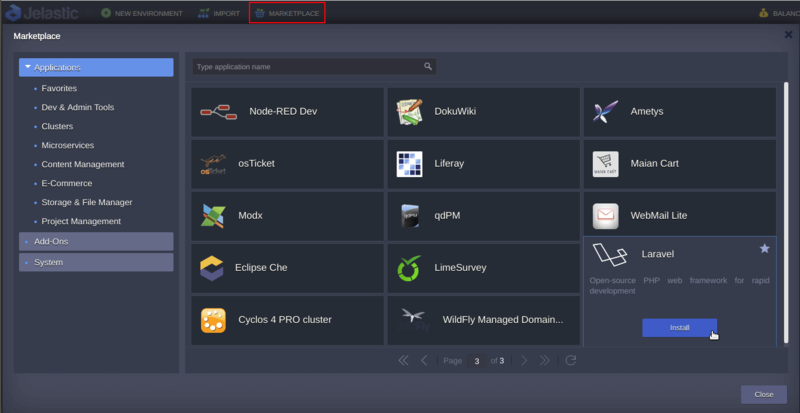 – database entry point hostname (e.g. node201708.laravel.jelastic.cloud). proxy.laravel.jelastic.cloud if there is a ProxySQL load balancer layer in front of database cluster. After each request is processed, the order of addresses will be cyclically shifted, moving first IP down, which results in even workload distribution among all of the layer nodes. As it is shown on the picture the Laravel project related links were changed with the fake data links. Open the phpMyAdmin panel specified in email to see these data in the database. Now, we can change the data in the table, click on Replace links as on the welcome page above. Change the data in the displayed form that is generated by the insertForm.blade.php layout template file or just press the Replace button to replace fake information with custom. Once data is applied, it is written to the database and displayed at Myproject welcome web page. The actual process takes less than 1 minute (see below). 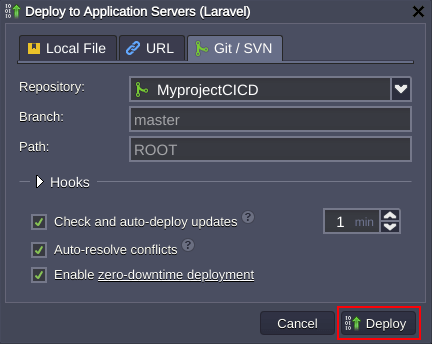 In order to start coding, you should establish a CI/CD pipeline from your local computer to Laravel application through Git server with the help of Jelastic Deploy from Git/SVN functionality. To describe an algorithm, we use Linux OS on local computer. 1. Create a new empty repository at GitHub and name it for example as MyprojectCICD. ~/webroot/ROOT/Myproject$ tar -cf myproject.tar . 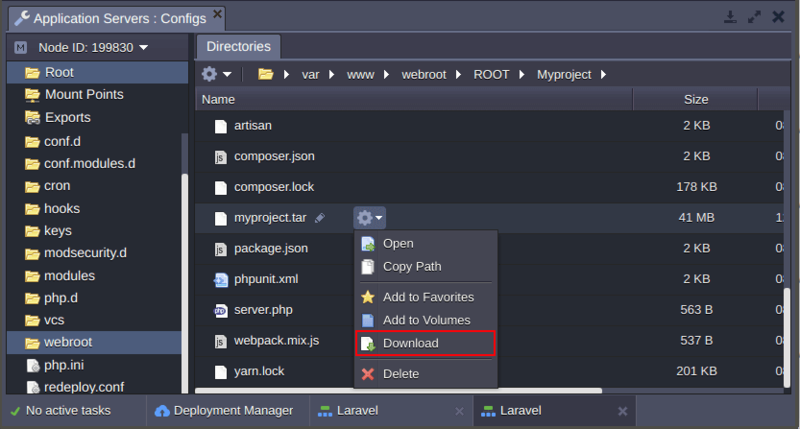 Download myproject.tar file via Configuration File Manager to your local computer. ~/MyprojectCICD $ git add -f .
5. Click on Deploy from Git/SVN to configure deployment as it is described in our documentation. Once Deploy button is pressed it clears ROOT context directory and puts MyprojectCICD repository content into it. Thus local Laravel PHP project is synchronized with project in the cloud and can be accessed by new ROOT context link, e.g. 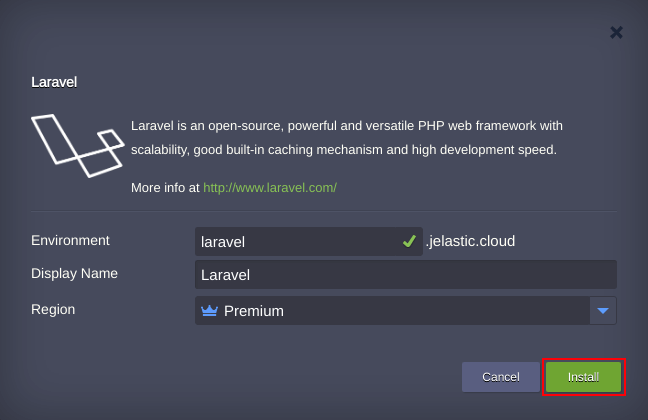 http://laravel.jelastic.cloud/public. Change your code locally via any text editor or IDE, commit changes, push them to GitHub and Jelastic will do the rest, just refresh the project webpage. Now you know all the basics how to install Laravel framework and start own PHP project in a few minutes using Jelastic PaaS. Try it out at one of the globally-available Jelastic providers.